In this guide, we’ll go over the top 4 TENS unit. We’ll go into the nitty gritty so you can get the pain relief faster without going through the stress of researching all the tens unit on the market. The TechCare 24 mode Massager is our budget pick and it’s got a price that’s hard to beat. It’s got an old iPhone-esque face to it, featuring a 3.75 inch back-lit LED screen and – as one would of guessed – 24 stimulation modes. These modes include acupuncture, deep tissue, foot, tapping, cupping, and combo for a total of 6. WAIT? I thought you said 24 modes? Yes, well there are 4 different settings – which use a combination of intensity and timing to create a pattern – in each mode. These are indicated on the device as 1,2,3,4. A little false advertising on their part but technically true nonetheless. The device is dual channel meaning you can treat two body parts independently. You can do this by clicking on the round button in the center which will allow you to toggle between channel A and channel B. The 4 other buttons will allow you to change the massage mode listed above, timer, and intensity level. The biggest gripe about it’s interface is the lack of being able to pause the device. You have to turn it off and turn it back on as a work-around. The packages comes with 3 sets of large electrodes pads for a total of 6. These are nice in that they don’t require gel, adhere to your skin very well, and don’t leave nasty residue. The cord that attaches onto the pads are pretty long at around 4-5 feet. It’s kind of a bummer that it doesn’t have a clip or a case to be able to carry it around easier. However, it’s got a 20-hour rechargeable battery and it comes with a small white case container to store the pads and to wrap the cords around. In a perfect world… this device would have a descriptive manual that outlines what each mode and it’s setting does. It’s left up to interpretation by the consumer. Also it’s greatest weakness is its greatest strength: the 24 modes might be overkill since it’s not easy to feel the difference between all of them. And it would pretty convenient to have a clip on the back of the device to avoid holding it whenever its in use. Our creative TENS unit pick, iRelieve PlayMaker(wired) is also an EMS(Electrical muscle stimulation). This means the device targets both sensory and motor nerves since they fire at different frequencies. Whether it’s for general pain relief or muscle rehabilitation, the PlayMaker is definitely worth taking a look. The iRelieve PlayMaker comes with the unit, a tote bag, belt clip, 8 small electrode pads (2” by 2”) and 4 large electrode pads (3.5” by 3.5”), 2 Lead Wires, and 3 AAA batteries. This unit offers 25 levels of intensities – these can be set independently between 2 channels – and 14 different therapy modes with 6 of them for EMS as well as a toggle between EMS and TENS frequencies. The different therapy modes are labeled P-1 through P-14, ‘P’ standing for program. All of this is manageable through 5 buttons on the device. 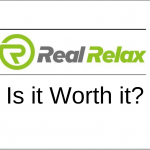 The electrode pads are proprietary which is worrisome because once they lose its stickiness(lasts about 20-30 uses), you’ll have to purchase it directly from iRelieve, leaving you with no other options. Luckily, they have their Dollar Electrode Club(sounds like they are riding off of Dollar Shave Club) which is a subscription model service for the electrode pads . The pads come in two sizes, small and large. The larger pads are for targeted bigger body parts such as the back. Since the unit can operate with one channel, this unit can either operate with 2 or 4 small pads or 1 or 2 large pads. Cool feature 1: It’s strong. How strong? 80 mA(milliAmps) output power. We scrutinized the power – since the unit is so small – and determined that the electric output is definitely equivalent to those found in professional physical therapy offices. Cool feature 2: auto-lock. Especially since this device can force your muscles contraction, it’s nice that it has a way to lock it so no button will be accidentally pressed. This can be done by press ON(+) and OFF(-) simultaneously. None of them are deal breakers but it would be nice if they were more up to the times with an intuitive user interface we are accustomed to. HealthmateForever is a known brand for producing a prolific line of TENS unit products. Rest assured, these guys have experience with producing quality TENS devices. Different design from the YK15AB model, the Pro15AB model looks more like old mp3 player with a LCD back-lit screen. It features a total of 15 preprogrammed of operational modes and two completely isolated channels without reducing the power in the half. Inside the box, you’ll find the device, 2 sets of adhesive electrode pads that measure 2.5 inches across for a total of 4, 2 sets of leads wire, USB cable and AC adapter wall charger, instruction manual, ands a pads holder to hold all the electrode pads. 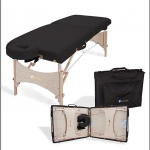 This device offers 15 different massage modes and 20 levels of intensity both of which can be set independently on ‘A’ and ‘B’ channel. The dial-like style set of buttons allow you to switch between ‘A’ and ‘B’ channel, select the mode, increase the button using the ‘+’ and ‘-‘, and select the timer with the ‘T’ button. As for our electrode pad analysis (it’s hard to use if it doesn’t stick very well to the body!) it is pretty adhesive like the others and don’t require gel. The lead wires snap onto the pads very easily and there is is a film that protects the adhesive before actual use. Cool feature 1: It’s FDA cleared. They have class II approval which means they declared the devices safe and effective. As a consumer, it’s nice to know the manufacturer goes out of their way to meet federal standards. Cool feature 2: it’s compatible with the wireless product WI9 (Not included). If you ever find yourself frustrated with the lead wires getting mingled and mangled this device offers a wireless alternative. Could there be improvements? Absolutely. After digging into the brand, we found out they offer wholesale distribution which means they are primarily a manufacturer. For the consumer, this means subpar customer service and less quality of products as their main goal is to massive produce products. 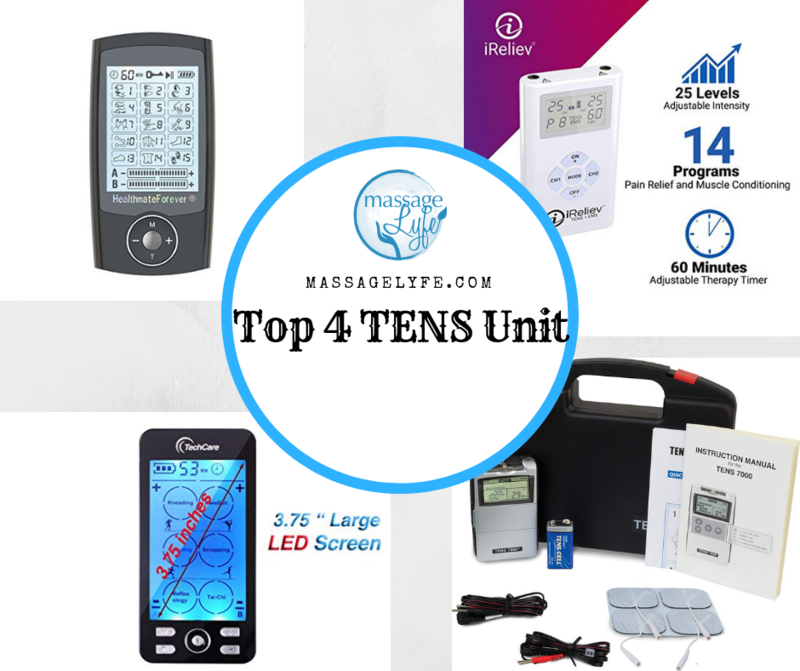 Our personal favorite TENS unit pick goes to TENS 7000 2nd edition. A 10-year pioneer in TENS devices, TENS 7000 has sold over 1,000,000 units worldwide. This device is unique among the bunch in it’s design and functionality. So let’s start with first impressions. The unit itself is pretty small but it’s contained in this black plastic medical type case with red latches. The box-opening experience is definitely above par. It’s kind of like gift wrapping where the gift itself is uncovered last and the instruction manual & electrode pads are presented first. The design is unlike other we tested. It’s got a palm size fit and looks more like a walkman or a radio rather than a smartphone which seems to be the popular design in the market. In terms of power, this devices packs quite the punch. It uses a 9-volt battery and a dial to set the intensity from 0-8. Myself and others included, we did not feel the need to go past 4/8 on the intensity scale. With the included battery, the device will last for about 48 hours. It is recommended to purchase rechargeable batteries. Also included are 4 economy electrode pads. The pads can be replaced by other brands so you’re not confined to one particular brand. In fact, they recommend silver pads from brands like StimChoice and inTENSity At Home. Silver pads are much more conducive to electricity which will distribute the charge equally among the 1.7 inch to 2 inch pads. Cool feature 1: You can control the frequency. From 2hz to 150hz, you can control the frequency of the charge using the up and down arrow buttons inside the control compartment. Cool feature 2: Plastic covers prevent accidentally changing settings. There is a plastic cover by the dial that controls the intensity and there is a plastic cover for the four button in the middle area. The worst thing about this device is durability/customer service. We tested the unit for several months and stopped working after 4. It seems like other customers are having similar problems. Another thing is the small zap that happens when bumping up a setting. It’s a small functionality flaw but a flaw nonetheless. A TENS unit stands for transcutaneous electrical nerve stimulation. Quite the mouthful, I know. To put it simply: it has sticky pads that deliver electrical current to painful muscle and tissue to ease the pain. So how exactly do electrical impulses help relieve pain on the body? There are two explanations. One is that the electrical current’s frequency interferes with the transmission of ‘pain messages’ to the brain from the spinal cord. If there are less ‘pain messages’ going to your brain, you’ll feel less pain. The other is that the electricity increases endorphins. Endorphins are hormones that interact with the receptors in your brain to reduce your perception of pain. Much like morphine, endorphins help block pain messages from reaching the brain without the actual side effects of opiates. Feel free to check out my article on How does a TENS Unit actually work? where I go into greater detail. Having trouble difficulty selecting the best TENS unit suitable for you? Look no further, I’ll address all the varieties and nuances that come with a TENS unit so you can be equipped with better knowledge. This means the manufacturer convinced the FDA their products are similar to other medical products on the market and thus are deemed appropriate for the general public. Keep in mind that for this type of FDA approval does not require clinical trial. If the product isn’t approved by the FDA, be careful as the company is operating under illegal pretense. Preferences in programs and modes vary from user to user. Some prefer more control and others want away with all of it. If you want more control, get a TENS unit that allows just that. You are going to need to educate yourself with terminology like pulse-width and wavelength. If you don’t want control, get a TENS unit that has many pre-set options. 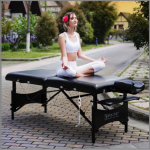 There are different categories such as therapeutic(Knead, Acupuncture, tapping, etc.) and some have custom designed modes that target specific parts of the body like shoulder, neck, and back. Channels refer to how many independent sources of electricity exists on the device. Generally speaking, the more the better since you’ll have more control this way. The standard for the market is duo channels. This means you can have two sets of electrode pads working different modes/programs and intensity. Most of the time you should choose to opt out for duo channels. The only advantage for single channel is cheaper price. However, we study found prices were very close among single and duo channel units. Being able to choose how strong the unit will pulse electricity is important since everyones tolerance and preferences are different. However be careful with implications. Levels of intensity does not indicate weak or stronger. A unit with 30 levels of intensity is not necessarily have a higher cap of strength than a unit with 15 levels. What you want to look for is a standard measure of output called milliAmps(mA). 80-100 mA is typical but if you’re really not sure, make sure to get one with a broader range. The timer is one of a TENS unit’s most important features. Why? If the unit turns off every minute, this would quite the hassle for the consumer. If the unit doesn’t turn off after 10 hours, the batteries would get depleted fast as well as wearing out the electro pads. We found that our user group preferred the 15-30 min window as the ideal timer. We’re at the time where lithium ion is the status quo in most of electronics. However, the TENS unit market is a little behind. Products have different sources of power such as AA, AAA, 9V batteries. If you don’t want to spend a continuous amount of money throughout the lifetime of the device, get a device with rechargeable batteries. If you’re a first time TENS unit buyer, you should purchase a smaller, sleek unit. 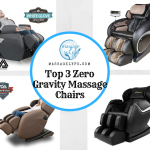 The heavier ones tend to provide value to more experience TENS unit consumers as it comes with additional features that are more appreciated by the experienced user. Also think about where you’ll decide to use the TENS unit. If you’re a consultant always on the go, you want to consider a portable unit as opposed to something hunky and hard to carry. The buttons are hard to test since you don’t have the product before purchasing it. However for the screen make sure to look at product photos where they showcase the screen. Back-lit screen is becoming a standard for the TENS unit in the market as some customers want to use them at night or in the dark. If that’s the case with you, make sure the product offers that feature. The lead wires is somewhat an obvious but often missed consideration. Purchase long lead wires as shorter ones are more likely to pull the electrode pads off your body due to its limited reach. The electro pads are an important feature of the tens unit. The most important aspect of an electrode pad is its adhesiveness. What we mean by that is: how long will it take for the stickiness to run out? Since there’s no standard measurement on stickiness (not that we know of at least) we recommend looking at the manufacturer description on the estimated lifetime of the pads and consumer reviews. Also be cognizant of how easily replaced the electro pads are, since some units only allow their own proprietary electrode pads while others allow for universal replacement. In order to increase the electrode pad’s adhesiveness, make sure to clean it regularly as residue is what makes it not sticky. Size of the electrode pads are important. If you want to target a larger muscle group like your back or your thighs, make sure the unit comes with large pads. If you want to target smaller areas like the forearm, make sure to have small pads. The standard on the market is to come with both. You obviously want to purchase a unit with warranty. Look for a minimum of 1 year warranty. The longer the warranty lasts, the more confidence the company is with it’s quality. If you see a warranty for 7 days, run the other way.